Sharon McCuen Studio - Welcome! Sharon McCuen is a Selinsgrove resident and retired public school art teacher. She is a working artist with a Master of Fine Arts degree from Penn State University. 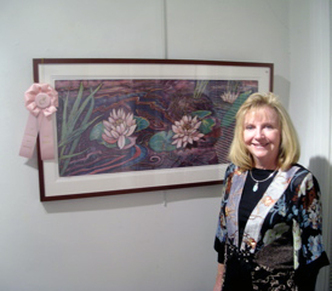 As an artist, she has shown her work in one-woman shows, group exhibitions and juried shows. She has won numerous awards as an artist and as a teacher. In 2005 the Pennsylvania Art Education Association selected Sharon to receive the Outstanding Elementary Art Educator of the year award. Her art work is primarily in painting and print making, with a focus on water-based monotypes and mono prints. Sharon’s inspiration for her art began in graduate school when she heard a philosopher speak about the "Stuff of Water" from Greek mythology. He suggested that artists have the ability to reach into the pool of memories where all one’s thoughts and deeds are deposited on their journey through life. We as artists have the gift to reach into this pool of memories and bring back to others the valuable truths that have been deposited there. It is her hope that people will glimpse these "Truths of Life" in the beauty of her work. She is often inspired by nature and the beauty of life in her surroundings. Art Association of Harrisburg, Pa.